As you can see there are six modules – Long Entry, Long Loss, Long Profit, Short Entry, Short Loss, and Short Profit (note non-necessary code was collapsed). I used the Sublime text editor to collapse the unnecessary lines of code. You can download a trail version from their website. I am no longer using the IDLE as my go to IDE – I have fallen deeply in love with PyScripter. I will delve into this subject later. If you are flat and you can buy or sell on the same day then you call both functions. This back tester will allow you to buy and sell on the same day – the only problem is it doesn’t know which occurred first: the buy or the sell. This can cause a problem because you need to know the correct position by the end of the day. Since we can peak into the future (be very, very careful) we can look at the close of the day and compare it with the long and short entry prices. Here is some code that might make your entries more accurate on those occasions where both orders could be filled. Increasing Trade Entry/Exit Accuracy - Maybe? 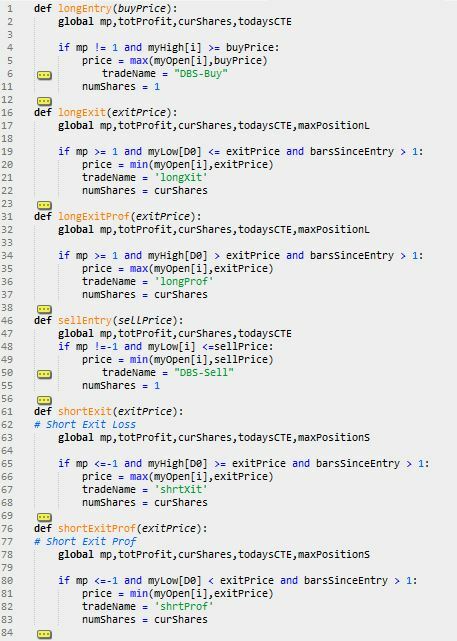 This code will execute the long entry logic after the short entry logic whenever the close is closer to the long entry price than the short entry price. If both orders are filled on the same bar and the close happens to fall closer to the long entry price, then the software assumes the short entry was entered earlier in the day and the long entry later in the day making the position at end of day long. Is this 100% accurate? No but it logically stands to reason that a close near the high would indicate they high was made last. Without intraday data we simply do not know what happened first.